Cheesemaking used to scare me. Then I lived in a foreign country where cheese was not readily available. It’s really true that necessity is the mother of invention. Did you know that powdered whole milk can be reconstituted and made into cheese? It’s not as smooth as cheese made from fresh raw milk, but it is very doable. And when you haven’t eaten any cheese in three months, it’s even delicious! 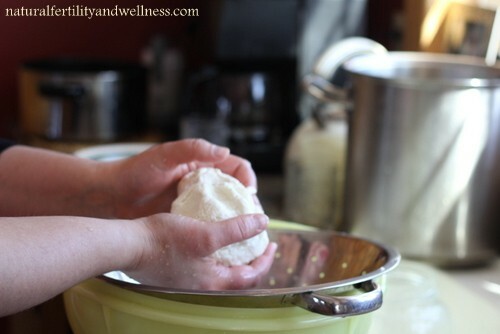 When we moved home and bought dairy cows, I made my first batch of mozzarella with fresh milk straight from the tank. Um, yum, y’all. Seriously. I’m not a fantastic cook, nor am I good at following directions (there may be a correlation there) but even I can handle this simple cheese. The biggest thing to remember is that cheesemaking is not a science (no matter what the books tell you!) it’s an adventure. And as long as you stick to the ingredients given, you can’t mess it up too bad. Even if your mozzarella turns out crumbly, lasagna is very forgiving. The best milk to use is unpasteurized raw milk but any milk will do. 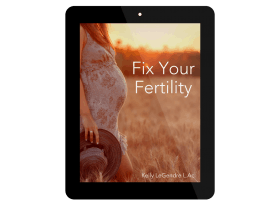 The only kind that doesn’t work is milk that has been UHT (Ultra-High Pasteurized) to extend its shelf-life. Fun trivia: Mozzarella was originally made from Water Buffalo milk in southern Italy. For rennet, your best bet is to order cheesemaking rennet online. Unless you have a cheesemaking store in your town, you’ll probably only find “Junket Rennet” which is not strong enough to congeal the curds. If Junket is the only available rennet, use 1-2 whole tablets instead of 1/4. Liquid rennet is easier to measure but doesn’t last as long. Tablets can be stored in the freezer and retain their strength for years. Fun trivia: Legend says rennet was first discovered by an ancient traveler who used a re-purposed calf stomach as a flask for his milk. When he went to get a drink, the liquid had formed curds. Today some rennet is still made from the lining of calf stomachs, but it is more popular to use the vegetable alternative. Citric Acid can be found at any grocery store in either powder or tablet form. It is basically concentrated citrus. Most cheeses use either citric acid, lemon juice, or vinegar to help curdle the milk. I use Real Salt in all my cooking, but any salt will do. Step Two: Pour milk into a stockpot and add the cup of water/citric acid solution. Mix thoroughly and turn on medium heat. You’re shooting for 90 degrees, which doesn’t take too long, so keep an eye out! Stir enough to keep the milk from sticking. The milk may begin to curdle. No worries. Step Three: Once you have the milk at 90 degrees, remove it from the heat and stir in the rennet solution. Keep stirring for thirty seconds. When your thirty seconds are up, stop the milk from moving, cover and set a timer for five minutes. Don’t touch the pan. You’re letting the rennet do its job. Step Four: When your five minutes are up, uncover and look at your milk. If the rennet did its job correctly, the milk should have formed into a soft jelly-like substance that is slightly separated from the whey (the whey is the watery substance around it). 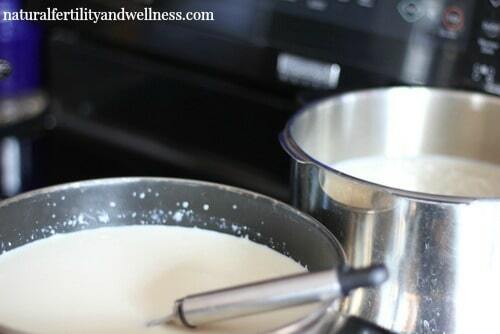 If the milk is still liquid, cover and leave it an additional 5 minutes. If it still has not set, your rennet may not have been strong enough. You can still use the milk, just heat it back up to 90 degrees and add new rennet. 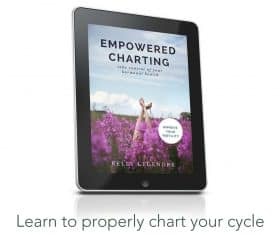 (Yes, I know this from experience!) 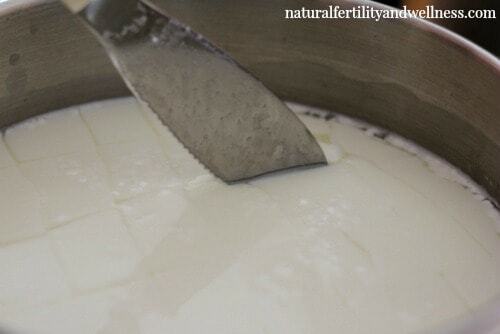 When it is set, take your knife and softly cut the curds, making sure you slice to the bottom of the pan. Cut a grid-like pattern. Step Five: Heat the curds to 105 degrees. Stir gently if needed. The curds will be loose and soft. Treat them nicely! 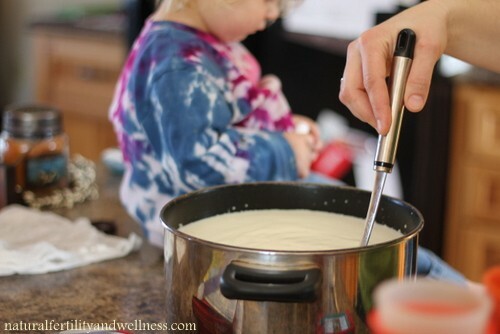 Step Six: Using your slotted spoon, lift the curds gently and place them in the colander. 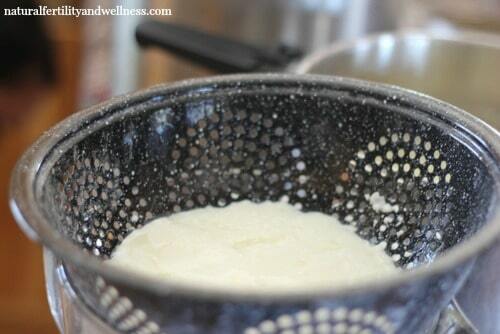 Spin the colander, allowing the whey to finish draining off. 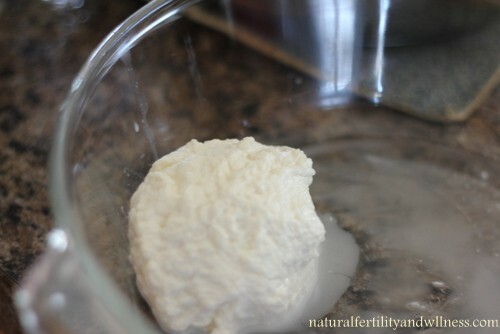 Step Seven: Place your curds in a microwavable bowl and microwave on high for 1 minute. If you have an especially strong microwave, you might want to start with 30 seconds. Step Eight: Carefully (it’ll be hot!) knead the cheese, adding your teaspoon of salt and mixing it through. Knead very gently and do not over-knead. The more you mess with the cheese, the tougher it will get (though still yummy, I promise!). If your cheese is very stretchy, it’s done. Form it into a ball, pat it gently, and tell yourself good job. If it isn’t stretchy yet, return it to the microwave for 30-second increments until it stretches easily. Form it into a ball, let it cool, and cut yourself a slice. And all that leftover whey? Don’t throw it away! It’s perfect to stick in smoothies, bread, or soups. 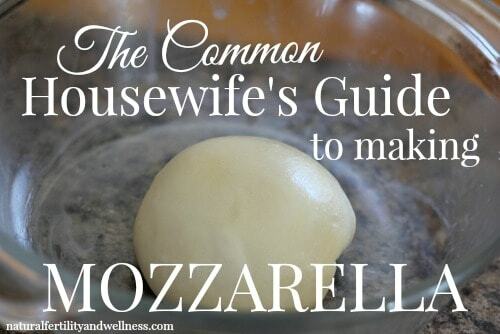 Troubleshooting: There are two common complaints when making mozzarella cheese. The first is that the cheese turns out crumbly instead of smooth. This can be caused by using pasteurized milk, or from using too much citric acid which can make the curds separate too quickly. The cheese is still perfectly edible. If it’s not pretty, just shred it up and use it as normal. The second is that the cheese turns out tough and slightly yellow. This is caused by too much rennet, microwaving it too long, or from over-kneading the cheese. It’s still super yummy. No worries. Melt it on your pizza and enjoy. 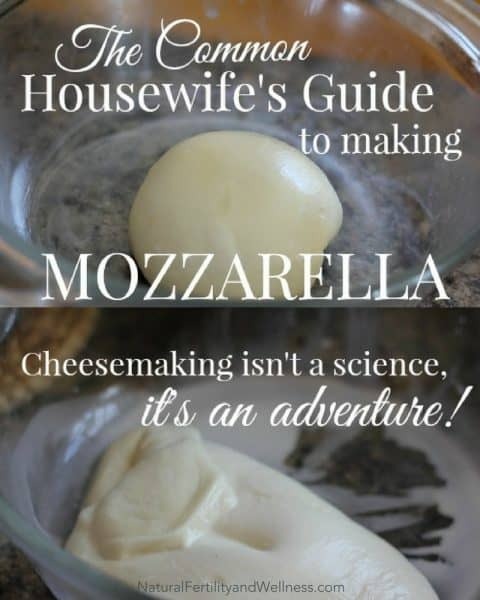 Have you ever made cheese? What are your best tips? I would love to try and make my own cheese, but we don’t have a microwave. What would be an alternative to the microwave? My friend keeps the whey warm (just before steaming hot) on the stove and dips it in for a couple seconds to get the cheese warm before kneading. Works best when done in small batches though!